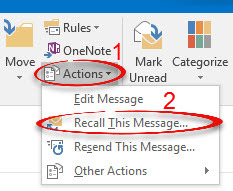 If you just sent an e-mail and realized that you wish you hadn't, Outlook can try to recall the message. This works if the recipient has not already opened the e-mail, and it only works with other etown.edu accounts. 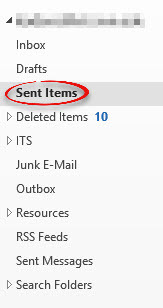 Step 1:Click the Sent Items folder in Outlook as soon as possible after sending the message. Step 2:Double click on the message that you want to recall. Step 3:Select the Message tab. Step 5:Select Delete unread copies of this message. Put a check next to Tell me if recall succeeds or fails for each recipient. Click OK. 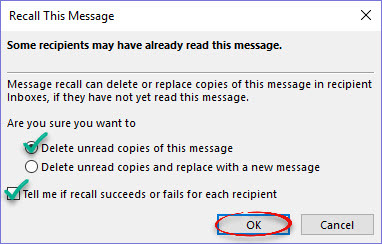 Step 6:You will receive a notice of success or failure for the message recall.